I'm putting an accessory Prest-O-Light acetylene tank on my 11 touring. The tank was originally copper plated. I'm hoping to re-create the copper colour with paint. The printing on the tank was black when new. The only decals I've located so far are from Restoration Supply. They can supply them in copper or silver. That won't work for me. Anybody know of a source for these in black? I should still have some, I know I found them a couple of weeks ago. I had the sets made with PRESTOLITE part in a copper color, and the rest of the label in black. PM me and I'll find them again. I can take pic's of my tank on my '11. Thanks Gary, I sent you PM. Here's a couple of pictures showing my original copper plated tank. 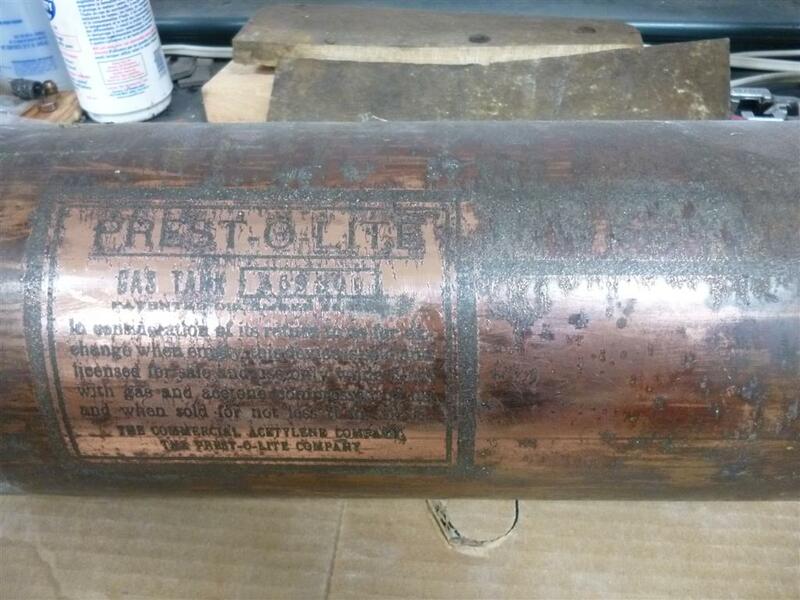 Why were the acetylene tanks intended for for early automobiles plated with copper as opposed to brass? My tank was brass,plated and then nickeled. Timothy- I don't know why they were copper plated. They sure look good though when the copper plating is new. I have seen a few in brass as well. I suppose its like today, you had a number of options for the look of your tank depending on how much you wanted to spend. I think I could make a clear waterslide decal with black letters, if I had a good jpeg of the original decal and the size. Here is a picture of a decal from another thread on this subject posted by Phil Mino. I don't think that this picture is hi-res enough to make a good decal. Thanks for the link Walter. Tom. That's exactly what I'm looking for. Maybe someone will come up with a high res picture. I can figure out the dimensions easily enough from another tank. Going by the description to which I posted a link, the printing on your new tank decal should actually be nickel colored. OK, I monkeyed around with it a bit. Here's what I came up with. The serial number can be whatever you want. Let me know if there are any changes that need to be made and what size it needs to be. Nickel wouldn't stand out enough to be read if it was over polished copper. It looks black on the old tank. Here are the dimensions that I took off the old tank. 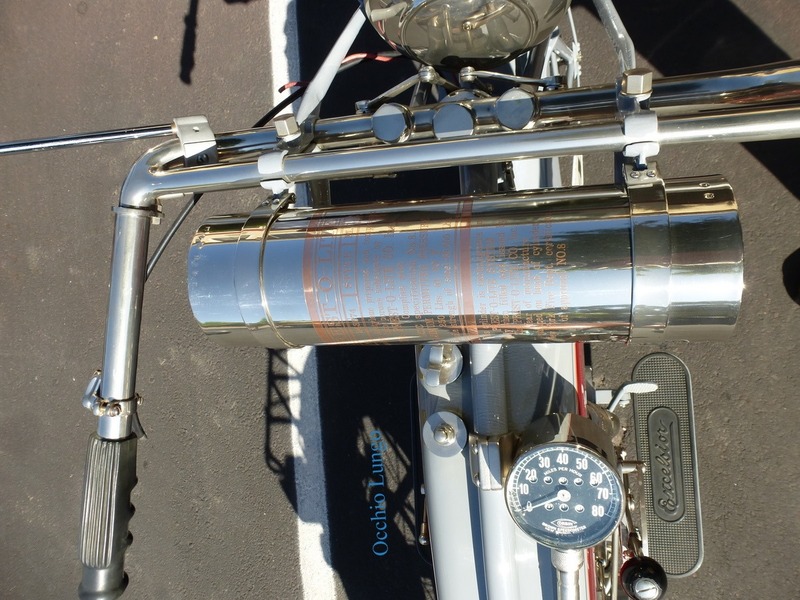 Do you intend to have this Prest-O-Lite tank functional? Nobody up here will fill the tank because of its age. I'll be hiding a plumbers tank under the rear seat. That was a good article you had in the HCCA Gazette a few months ago. I'll use that information for my install. I'd like to preface this by saying to please understand that I'm not trying to pick apart your project. I'm just trying to understand the original plating process. While only a metals lab could tell us what it looked like when it was new, I think the nickel letters turning black is the result of age and exposure. There look to be several patches outside the lettered area that are the same condition as the letters themselves. I suspect that is where the copper wore thin and the underlying nickel was exposed. I'll bet that's why the Restoration Supply decals come in silver or copper (copper for tanks nickeled on the outside). At any rate, it's an interesting piece. It's not often that you see one in a condition where it can be studied. I bought a Prest-O-Lite "B" tank at my welding supply yesterday, 40 cf. It was in his refill bottles and was certified in 2013. It came in this week because it wasn't there last Saturday. 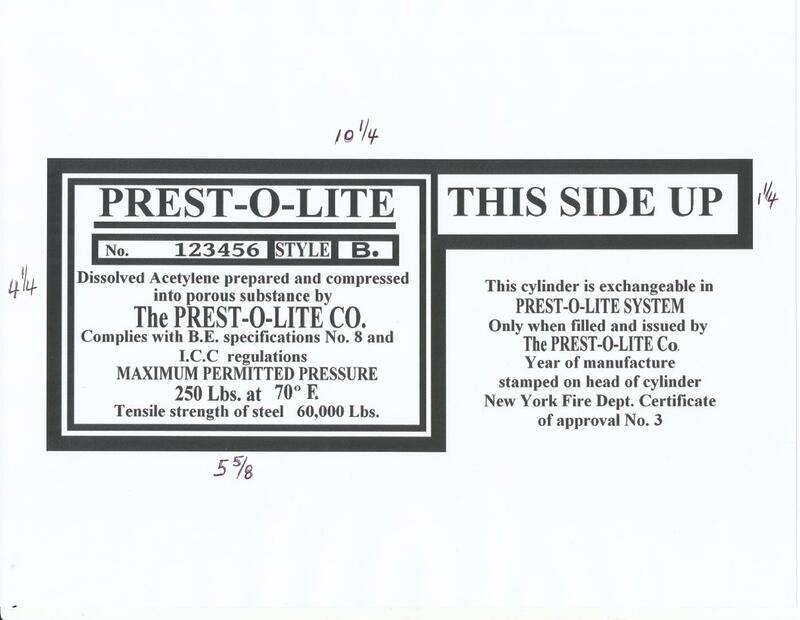 It has the raised script "Prest-O-Lite" embossing on the lower 1/4th of the bottle. Nice tank with no pits at all. It appears to be a copper plate/nickel when I looked at it this morning. The bossed area on the tank head is copper that was left copper. It has been painted a number of times in the past. They show up at the supply houses and the date is on the head somewhere. The supply houses will exchange them for a full bottle for $38 but I want this bottle back unless a prettier Prest-O-Lite comes in. I am in the process of lighting up the John Brown 16's on my '14. Royce lit up his headlights at the Texas T Party in San Angelo, TX, this last October and that really looked neat. Brighter than I had imagined and he was running off a carbide generator. Ken, does that tank have the fuse in the bottom? It may certify. 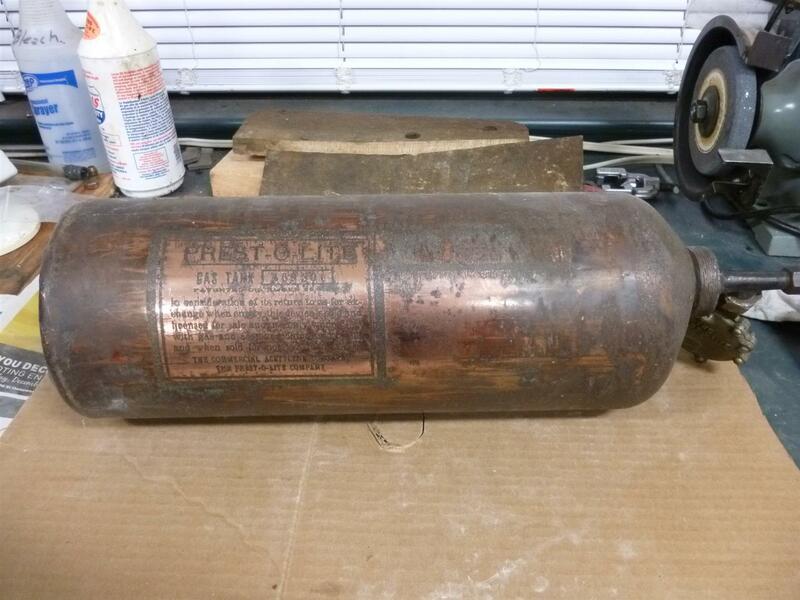 Walter I think you may be right, the copper plated tank might have had nickel lettering. Possibly the intent was to have the nickel turn black from exposure to the air or some other process. This would allow the contrast needed to be able to read it. I don't think that polished nickel writing on a polished copper tank would be very discernible. Ken My tank has a brass gauge on the bottom of the tank where the fuse would go. It could possibly be removed for testing but I haven't tried. I don't want to damage the gauge. We have a few guys in our club who use their carbide generators too. It's quite amazing to see them work. I'll be happy to use a modern small tank hidden away to give me light at night. I took the gauge out of my original tank and replaced it with a plug. I found a guy in NJ who filled it for me but that was many years ago. I don't know if anyone will fill it again but I don't see why they would not be able to test it and refill it if it passed.